Taj Mahal Darwaza gate, Bagh tomb gardens and Hawz pool from the south side of the mausoleum. Add tags for "Taj Mahal Darwaza gate, Bagh tomb gardens and Hawz pool from the south side of the mausoleum.". Be the first. 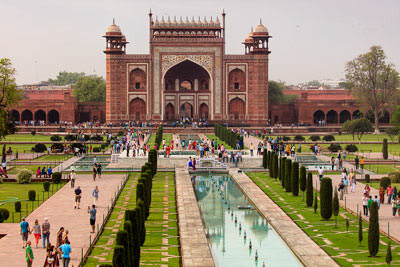 <http://www.worldcat.org/oclc/964389776> # Taj Mahal Darwaza gate, Bagh tomb gardens and Hawz pool from the south side of the mausoleum. schema:about <http://www.worldcat.org/oclc/964389776> ; # Taj Mahal Darwaza gate, Bagh tomb gardens and Hawz pool from the south side of the mausoleum.